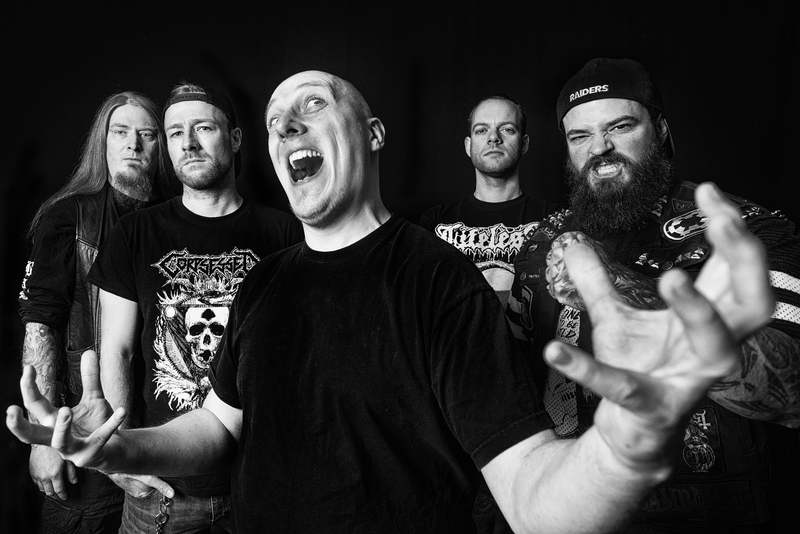 ENDSEEKER – since 2015 this name stands for finest Swedish style Death Metal from Hamburg, Germany. Hard as a fist and uncompromising like binge drinking on St. Pauli – but with a big chunk of heart and soul to it. 2015’s EP „Corrosive Revelation“, released on F.D.A. Records set the benchmark for the things to come. Produced by Eike Freese (Dark Age) and Alexander Dietz (Heaven Shall Burn) there was hardly any review not praising the band’s first sign of life. From there on ENDSEEKER served their sound to numerous metal fans all over Germany. Their gnarly HM-2 sound sawed through some ears at Summer Breeze Open Air, In Flammen Open Air, Angerfest, Grind The Nazi Scum, Holsteiner Death Fest, Weltturbojugendtage, Ear Terror Festival, and many more. They shared stage with bands like Kvelertak, Mantar, Lifeless, Demonbreed, Negator, Weak Aside (and many more) and are already confirmed for Party.San Metal Open Air 2018 as well as some other festivals and club shows. On „Flesh Hammer Prophecy“ ENDSEEKER once again bend the knee to the Swedish heroes from the early 90’s but still keep a distinctive level of originality. Who the hell can stop them now?